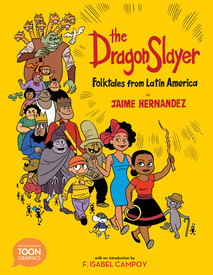 In the 40 full-color pages of The Dragon Slayer, Jaime Hernandez puts his finely honed comics-making chops into service on behalf of transmitting three classic Latin American folktales to comics readers of all ages. Within these pages the reader will encounter a king, a prince, a mysterious old woman, a dragon, a giant, magic talismans, romantically inclined talking animals, a sleepy but clever boy, hard working ants, and, especially, smart, strong and savvy women (along with a few not so). Together, these various casts of characters provide a window onto the wider world(s) of folktales and impart easily grasped moral lessons on the value of kindness, steadfastness, diligence, and cleverness (and more!) along with exposing the risks of vanity and literal mindedness (among others). 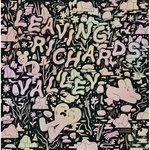 Something about the light airy drawings and full vibrant colors (along with the occasional talking animal) is reminiscent of classic cartoons of the 1940s and '50s. ToonBooks has posted a nice preview on their page for this book, HERE, so you can get an idea of what we're talking about. It's an all-new collection of comics by Jaime Hernandez! What more do you need to know? Let's hope that there's more to come! The hardcover edition is available here.